Plays mp3 files directly from Usenet newsgroups like a radio. Install, enter your account information and it starts playing mp3 files automatically. It's that simple. Stop, pause and play using familiar media player controls on the main window. Advanced users can edit or create new group lists that combine search results from multiple newsgroups and servers. All the popular encoding schemes are handled automatically. Qweas is providing links to Usenet Radio 1.00 as a courtesy, and makes no representations regarding Usenet Radio or any other applications or any information related thereto. 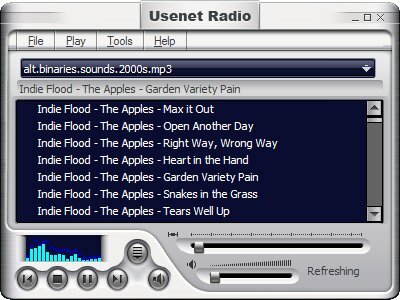 Any questions, complaints or claims regarding this application Usenet Radio 1.00 must be directed to the appropriate software vendor. You may click the publisher link of Usenet Radio on the top of this page to get more details about the vendor.